Among Amid While: Ditmar and Hemming joy! 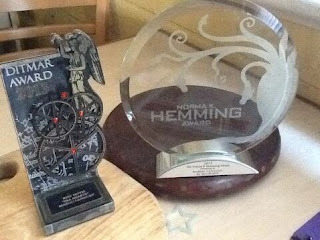 On Saturday night at the Conflux 9 convention in Canberra, I was very honoured to receive, for Sea Hearts/The Brides of Rollrock Island, the Norma K. Hemming Award (for exploration of race, gender, sexuality, class or disability in science fiction or fantasy), and the Ditmar Award for Best Novel. Thanks, Deborah Biancotti for hosting a great awards night, and thank you, Hemming and Ditmar judges, for all the hard work that went into making these awards happen. The judges of the Hemming Award wrote: "Sea Hearts takes us on a journey through what it means to be male and female, lover and loved, thing and person, and Lanagan's rich prose goes beyond the fantastical towards new sensibilities and understandings." Congratulations, Margo! So great to see the continued recognition that this book is deservedly receiving.